Sidney Jones has looked good at the slot corner spot, but it's perhaps fair to be concerned that he may be injury-prone. Question from LostInChiTown: The Eagles’ 2017 draft Is not looking as good in hindsight. Barnett is good, not great. Sidney Jones is promising. Rasul Douglas can’t get on the field. Mack Hollins hasn’t progressed. Donnel Pumphrey was cut. Shelton Gibson can’t get on the field. And I guess not much was ever expected of Nate Gerry or Elijah Qualls. Overall, not as many hits as initially projected. Is the Howie / Joe Douglas drafting era overhyped? Or was that just a bad year? • DE Derek Barnett: Barnett had a good rookie season. He had 5 sacks, a forced fumble, a couple recoveries, a couple of blocked kicks, and he played good run defense (excellent run defense for a rookie). And then in the playoffs, he came up with two huge plays. And he did all that as a backup, at a position where players typically don't produce early in their careers. This year, I think he has improved, and he's only going to continue to get better. I'm surprised that you're souring on him. • CB Sidney Jones: I thought he was the Eagles' best "starting" corner the first six weeks of the season. The start to his career after the torn Achilles is encouraging. I do think there are already legitimate concerns that he's an injury-prone player. To be determined how long his current hamstring injury keeps him out. 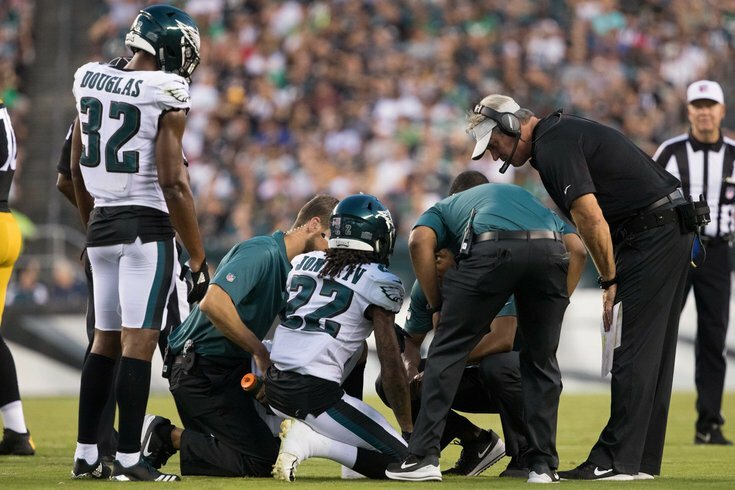 • CB Rasul Douglas: The fact that Rasul can't get on the field with all the Eagles' injuries looks worse than it is. They lost a safety and their slot corner. He didn't play safety at WVU, and he isn't built to play in the slot. He's an outside corner only, and that's the spot where the Eagles have stayed healthy. When Ronald Darby went down a year ago, Rasul was the first guy off the bench, and he played reasonably well. He would be the first guy off the bench this year as well if Darby or Jalen Mills went down. They just haven't. I wouldn't worry that he can't get on the field at positions he's not equipped to play. • WR Mack Hollins: He got hurt, and went on IR. He hasn't played a single snap this season. How can he progress? • RB Donnel Pumphrey: Obviously, Pump was a bad pick. • WR Shelton Gibson: As a rookie, Gibson had maybe the worst training camp I've ever seen a drafted player have, but he was significantly better in 2018. He made a nice play adjusting to a deep ball against the Vikings, but then was called for an illegal formation penalty because he couldn't line up correctly. Perhaps things like the latter are what is keeping him off the field. Like edge rusher, the wide receiver position can take a while to master at the pro level, so there's some reasonable expectation than he'll continue to get better. Also, the Eagles drafted Gibson knowing he was a bit raw, and he was a fifth round pick, so his slow progression shouldn't be a huge surprise, but it is certainly alarming that six receivers (including guys like Kamar Aiken) have gotten more snaps so far this season. • LB Nate Gerry: Gerry was the last pick in the fifth round. He's a core special teamer who nearly won the starting WILL job this offseason. That's not awful. • DT Elijah Qualls: Sixth-rounder. Didn't pan out. It's also worth pointing out that the Eagles heavily prioritized finding undrafted talent in 2017, and they wound up with Corey Clement from this draft. If you can get three hits out of a draft, that's a good draft. Obviously, time will tell, but as of 10/17/2018, I wouldn't say it was a "bad year" at all. Not yet, anyway. Question from Guido Merkens: Is picking Pumphrey over Kareem Hunt the biggest Eagles draft mistake in recent memory? Hunt went 86th overall, while Pump went a round and a half later at 132nd. Soooooooo, I guess I'm confused by this question. Question from Boaty McBoatface: What is the reason behind benching Wisniewski? Are they trying to trade him? Or do they actually believe in Isaac as a starter? It’s just weird to me that an excellent guard got benched for a guy who had some noticeable struggles, even though he has improved now. Well, to begin, I’d tap the breaks on calling Wis “excellent,” ha, but your question is fair, Boaty. I do believe the Eagles when they say they think Isaac is the better player. It’s all about perception there. You last saw Isaac getting killed Week 2 last year against the Chiefs. They see him and Wis up close in practice every day. Sticking with Wis is perhaps the safe choice. I applaud taking the risk if the true belief is that a player is better. Question from Bob: Am I crazy or is Seumalo’s best position tackle? I don’t think it is. I think it’s at guard or center, but you’re not crazy. Jeff Stoutland actually got asked that on Monday. I watched all of Seumalo’s snaps from the Giants game, and while he did move to tackle in the fourth quarter, the Eagles mostly ran it with a big lead, and when they did pass, they were low risk plays. It wasn’t like Carson Wentz was taking seven-step drops. On size alone, Seumalo doesn’t have ideal measurables. If you were to compare him with other tackles around the league since 2000, he’d be in the eighth percentile for height, the 16th percentile for weight, and the ninth percentile for arm length. At some positions, the Eagles care less about size than other teams around the league. Safety, for example, is one of those spots. But they don’t want a 6-foot-4 offensive tackle with 33-inch arms, unless he's Jason Peters. Part of Seumalo’s value is that he can play tackle in a pinch, but he’s not a long-term answer there. Question from JH: Does Foles get traded? What teams might be interested? Part 2 of that question is the problem. Who would trade for him? Presently, nobody. If some quarterback is lost for the season over the next two weeks of games, then maybe, but that would be the only way, in my opinion, and even then there wouldn’t be many cases where it would make sense. Question from Chief: Who is the worst coach in the NFC East? From watching Amazon's "All or Nothing" documentary about Dallas' 2017 season, Garrett seemed to lack leadership qualities. On top of that, his in-game strategic deficiencies are well-documented, and he doesn't even call the plays. I'm not sure what function he serves beyond serving as an agreeable puppet for the meddling owner. And yet, I'd still take him over Shurmur. Question from JPP's Index Finger: What would you give up for Amari Cooper? Fourth-rounder, maybe? I'd trade a 4 for Amari Cooper in a heartbeat. The Raiders wouldn't. Question from superguysteve: Am I going to hell for being excited at the prospect of Brock Osweiler starting more NFL games? God wants to see it too.